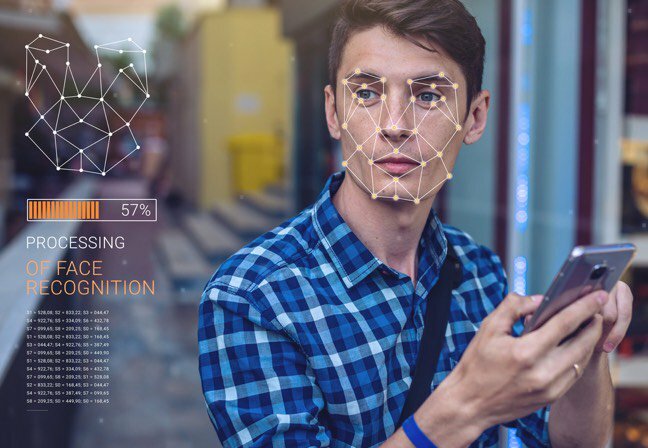 The American Civil Liberties Union (ACLU) continues the campaign against the use of face detection systems by federal agencies and the police. ACLU insists that the quality of these systems is too low for real use. As a result, there will be many false positives, because of which innocent people will suffer. 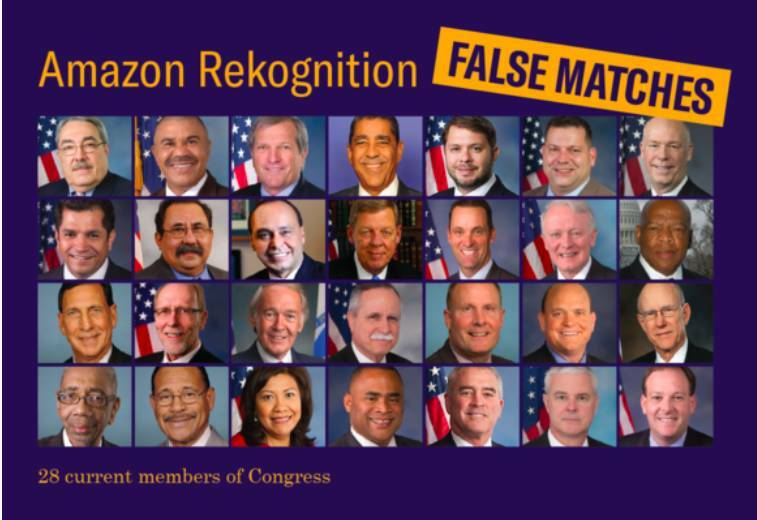 Trying to convince the US Congress to ban the use of these systems, human rights activists took a bold, but effective action: they drove through the face recognition system Amazon Rekognition all American congressmen. The result was a bit predictable: the system recognized 28 congressmen as criminals . Photos of the "heroes" in the screenshot above. concluded contracts with police units in Washington County, Oregon and Florida. The head of the company Jeff Bezos positions Rekognition as an effective tool for real-time face recognition, including video streaming, which comes from wearable video cameras on the uniform of policemen. This is reminiscent of the system, which this year is began to test in some cities of China, including in the city of Zhengzhou (Henan Province in the east of central China). 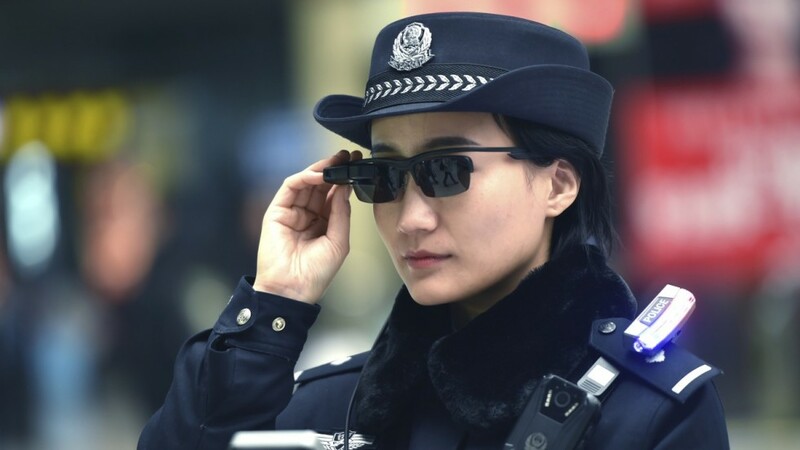 There, the police issued special glasses with video cameras, which are also connected to the software for face recognition. Gadgets were issued primarily to traffic police officers who work at the busy railway station of East Zhengzhou, because most people are passing through before their eyes. The glasses are specially designed for the police and are connected to a palmtop computer. After scanning the person's passer-by, the computer connects to the central database where the matches are searched. The experiment proved to be effective: by February ? the police managed to identify seven fugitives who are accused of hiding from the scene of traffic accidents and human trafficking. But in China to protect human rights are more lenient: there are already on the streets running 170 million CCTV cameras , which are connected to a unified system of face recognition. False positives do not bother anyone particularly if the system helps catch real criminals. But American human rights activists believe that false positives are evidence that the system is not yet ready for use. The ACLU test results showed that Rekognition mistook images of 28 innocent congressmen for criminals. It is interesting that wrong operations are distorted towards people with black skin color. Among the "affected" congressmen, 39%, although in reality black congressmen make up only 20% of the lower house of parliament. Such results confirm the fears of representatives of black groups, which are set out in letter Congressional Black Caucus to Amazon that the use of the face recognition system can have "deep negative unintended consequences" for the black population, illegal migrants and protesters. In fact, there are indications that the system is more often mistaken when comparing black people, especially women. Well, in general, everything fell under the distribution - both Democrats, Republicans, men and women of all ages from different regions of the country. All of them were among the errors of the system. Representatives of the ACLU believe that every false positive act poses a threat to human freedom. A policeman may prejudice such a person by questioning him or searching him. The scan was made on the public service Amazon Rekognition, the cost of the service was $ ???. For comparison with photos, 535 congressmen and senators selected 2?000 publicly available photos of people in handcuffs. The test was carried out with the default settings. 28 errors mean approximately 5% of false positives. Theoretically, this can be a good result, but if applied to thousands of people, it means a lot of innocent people who are searched because of a program error. Of course, all the results of the program will be checked by people, but we all know that such systems can quickly get out of control and go into automatic mode, as happened with the system for issuing fines for speeding. The ACLU urged Congress to "introduce a moratorium" on the use of this technology, until it begins to issue acceptable accuracy.